Founded in 1894, Scottsdale, Arizona is a major city in Maricopa County. It was originally purchased during the 1880s for a sum of $3.50 an acre by US Army Chaplain, Winfield Scott, who had taken up interest in the area due to its good potential for agriculture. 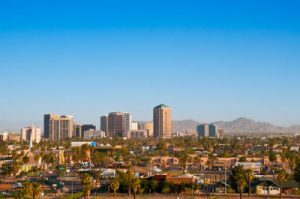 Today, Scottsdale is ranked as the 95th largest city in the US in terms of population size, with around 220,000 residents. The city covers a rather large geographical area of approximately 180 square miles and has a moderate population density of around 1,100 residents per square mile. This matches Scottsdale’s profile as a largely suburban city, prone to an array of differing pest complaints. The following will take a look at a few of the main pest concerns in the Scottsdale area. The climate of Scottsdale is classified as an ‘arid climate zone’. Due to this, the city experiences extremely hot summers and mild winters. Additionally, annual precipitation in the Scottsdale area is rather low at less than 10 inches on average. This combination means that pest activity is high and generally consistent all year round. Common pest complaints in Scottsdale and the surrounding area include those that are particularly well suited to hot climates, including scorpions, snakes, and spiders. All three are rather fearsome pests, although scorpions can be particularly nasty. These members of the arachnid family have a hard exoskeleton, two pincer claws and a whipping, barbed tail through which it can deliver a dose of venom. Scorpions are common in hot arid or desert climates and often nest under a domicile, protecting their young from the extreme heat. A common place to find scorpion infestation is below a house as the dark, cool conditions are perfect for nesting scorpions. Scorpions can be a worrying problem for home owners, especially for those who own pets or have small children. The seriousness of a scorpion sting depends both on the species of scorpion and the reaction of the victim. In the most severe cases, stings can result in anaphylactic shock and can be fatal. What’s more, scorpions are highly mobile and have a tendency to hide in dark places (such as inside shoes), which means that it can be easy to fall victim to a sting from these pests. If scorpion presence is detected or suspect in a home, the best course of action is to call a licensed exterminator. Many offer free inspection services and can quickly determine whether there is in fact a scorpion population present and then offer a treatment plan to eliminate the infestation and prevent scorpions from coming back. One of the most reputable pest control service providers in the Scottsdale area is Scottsdale Exterminators. This company offers a range of control needs for different types of pests including the types discussed above, and others common to the area. Scottsdale Exterminators also offers both treatment and prevention plans, with quarterly and yearly packages designed to take care of potential pest problems before they occur. They also offer a range of commercial pet treatment solutions for businesses. Other options for pest control in the Scottsdale area include Watts Pest Prevention and Cummings Termite & Pest Control.